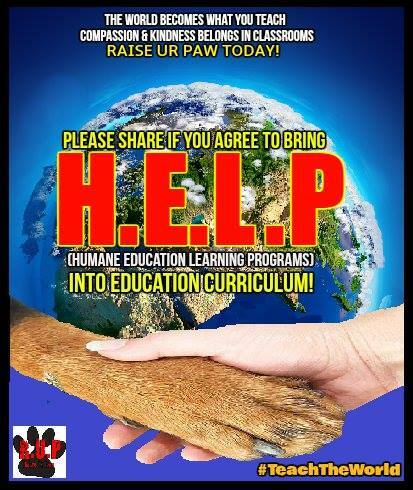 We at Raise Ur Paw would like to introduce the idea and future development of our H.E.L.P (Humane Education Learning Programs). Our H.E.L.P was created by our not-for-profit incorporation, RAISE UR PAW CA9102493 with the mission to bring upon the fostering of compassion and respect for all living beings and the environment through educational lessons and resources for youths and educators within educational institutes and facilities. Such educational services and resources are specially designed to provide a combination of focus points such as building awareness, sharing knowledge and resources, animal protection, responsibilities, environmental preservation and encouraging and empowering the involvement of youth of all ages. With our advocacy efforts and our strong aims and goals, we are hoping to directly present our humane educational learning programs and services to educators and students in hopes of establishing and forming impacts upon our young individuals and their development. Raising awareness and education on current animal welfare issues, along with promoting kinder and compassionate choices in order for our youths to play their active roles and parts for our voiceless, and the world in which we reside in. Gaining support, empathy and empowerment to create a world of acceptance and compassion towards animals of all species and using such skills to be positive role-models and action takers. To establish and encourage involvement from youths and those around them (family and friends) and participate in the efforts that is imperative in the fostering of a kinder and compassionate world and future. These programs will be designed and linked to age-appropriate instruction, materials and resources and will provide students/educators with the necessary tools to make positive changes and differences, role-models, lifestyle decisions and informative teaching that they can carry with them as they journey into the future. We believe that our programs are not only imperative, but essential in the development of young minds for a kinder and more compassionate world and future --- and that such an introduction of important lessons within the education curriculum is a step in the right direction.
" When educating the minds of our youth, we must not forget to educate their hearts"
Raise Ur Paw Today For The Future....For Life!